Linda Grinde (left) explains the cultural and political significance of “The Hellgate Treaty” just moments before curtain call. 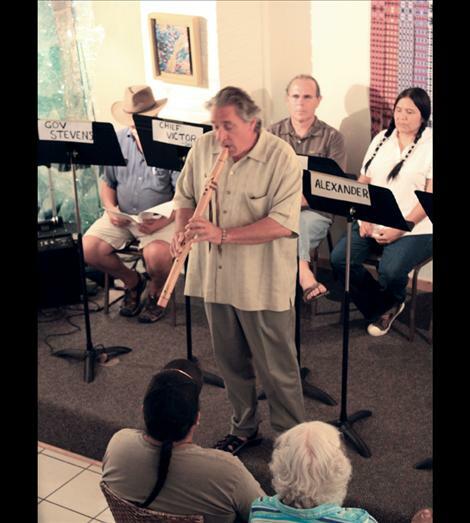 Friday’s preformance began and ended with a flute solo by Gary Stroutsos. ARLEE - Jennifer Greene, a Salish playwright, sits onstage at the Hangin’ Art Gallery in downtown Arlee late Friday night. Her play, “The Hellgate Treaty,” has just been read aloud by several performers to a chorus of applause and cheers. Greene’s play, “The Hellgate Treaty,” summarizes the meeting between federal officials and tribal leaders that sent the tribes to live on the current Flathead Reservation. 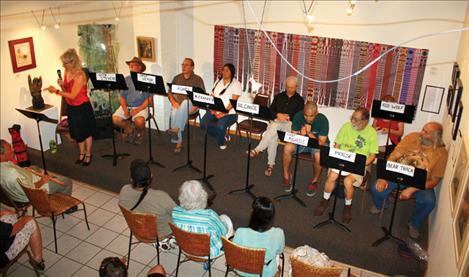 The play closed a weeklong festival at the Hangin’ Art Gallery in Arlee. Event organizer Linda Grinde said this was the second year of a long-term plan to have an indigenous theatre festival on the Flathead Reservation. The long-term goal is to expand beyond borders and allow tribes from everywhere to come and participate. “Both last year and this year have exceeded all expectations,” Grinde said. The festival began Monday with a play by Zan Agzigian and Vic Charlo called, “Moon Over Mission Dam.” This was the first time the play had ever been seen in the Mission Valley, and it was aptly preformed at the Vic Charlo / Johnny Arlee Theatre at Salish Kootenai College. Just as Friday’s play was set to begin, more than 20 university students from Syria, Lebanon, Egypt, Tunisia and Morocco ordered coffee and desserts before taking their seats in the audience. The students were participating in a five-week tour of the United States sponsored through the office of the commissioner of education. As many of these students were Muslim, they’d been fasting all day in observance of Ramadan and gave up both their dinner and sleep in order to attend the play. Their guide while on the reservation, Julie Cajune, took them to Kerr Dam, several museums and spoke with them at length about the languages on the reservation. “It’s always such a great idea to share opportunities. They’ll go home with an image of Native American people which was given by the native people,” she said. This is the first time such a tour has included a visit to a reservation. Wadii Boughedir, a university student and human rights activist from Tunisia, was asked to step onstage and fill one of the play’s roles. Boughedir said he enjoyed the participation aspect of the trip, and that it was a good experience, a moving experience. “I’m always asking a lot of questions about Native American history and culture and what’s going on. It’s important because there are natives in my country,” he said. Boughedir also said that the natives in his country, called “Amazigh” or “Burben,” will soon lose their native language and do not have many rights as citizens. Worse, many of his countrymen don’t even know his country has natives. Perhaps Boughedir and the others will take this idea back to their own countries and begin teaching others how to preserve their history, culture and tradition through music and theatre. “Many people won’t read a history book, but many more will go see a play,” Cajune said.